Quarter grapefruits and remove the fruit, leaving the white pith. Cut each quarter of peel into half-inch strips. Place peels in a saucepan and cover them with cold water. Bring water to a boil, let it boil for a minute, drain and repeat for a total of 4 times. After the last drain, return peels to saucepan. 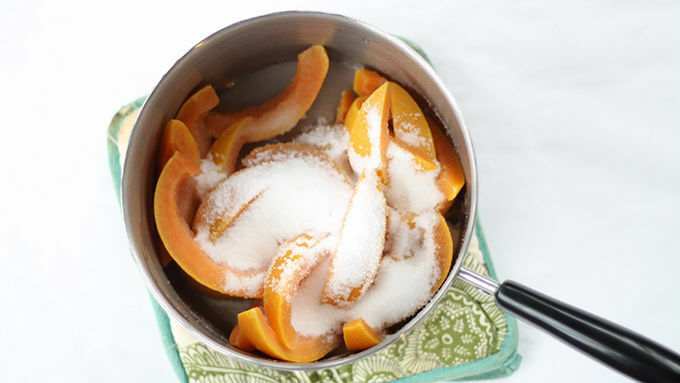 Sprinkle 1 cup sugar over peels and fill saucepan with just enough water to cover grapefruit. Bring to a simmer and lower heat, keeping it at a gentle, low simmer for 2 hours. After that, a lot of the water will be absorbed and what’s left should be syrupy. Line a baking tray with wax or parchment paper and place a wire rack on top. Use a slotted spoon and transfer peel to the rack. Let peel dry 2 to 4 hours. 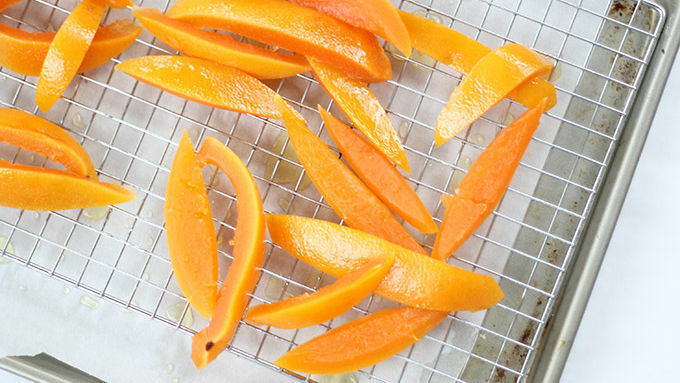 When ready to serve, roll peels in additional sugar (about 1/4 to 1/2 cup). 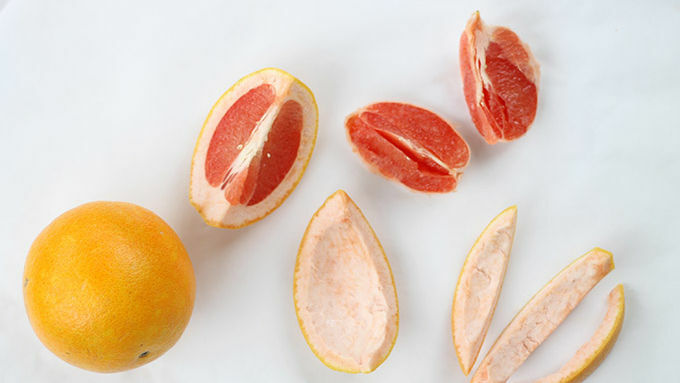 The sugar coating will absorb into the grapefruit peel overnight, so you may want to re-roll in sugar the same day you’re serving. Try dipping the grapefruit peel in melted chocolate. Homemade candy is so far beyond the store-bought stuff. (Not that I’d turn down any store-bought stuff, mind you, but there really is a difference.) And candied grapefruit peel is so sweet and lovely with its perfect citrusy flavor. Plus, it just seems so old-timey classic, doesn’t it? 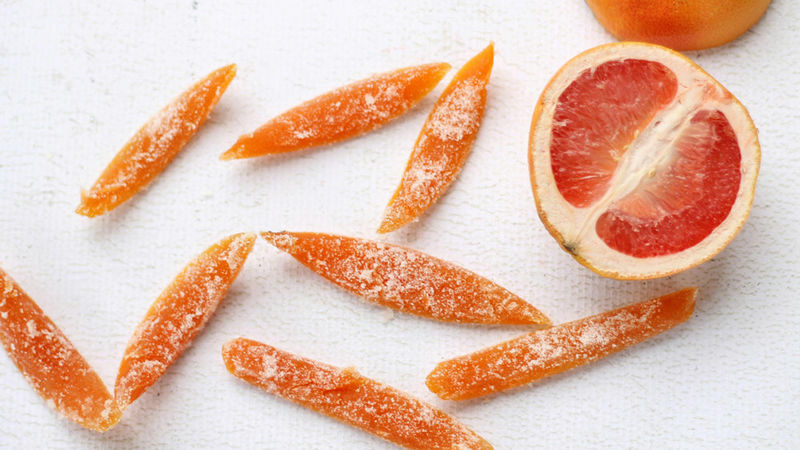 As far as candy-making goes, candied grapefruit peel is pretty darn easy to make. 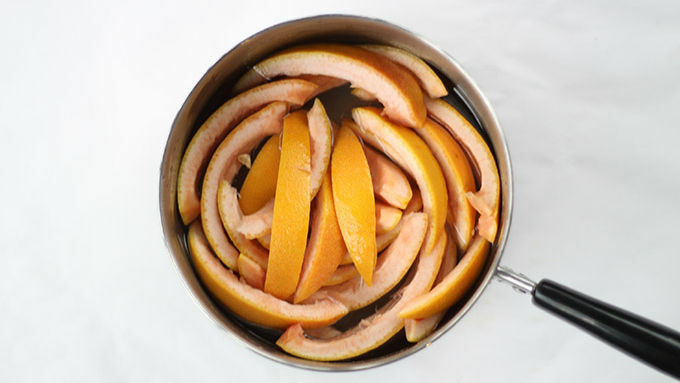 With this method you just let the grapefruit peel sit on the stove for a couple hours and let time and heat do the work for you. That said, you’ll need a good amount of time to make it, but the hands-on part is pretty minimal. And if grapefruit isn’t your thing, feel free to substitute oranges. Want to add even more oomph? Dip the grapefruit peel in melted dark chocolate. Divine!